If you’ve driven a new General Motors vehicle with a navigation system recently, you may haven noticed a feature that displays the speed limit of the street, road or highway on which you’re driving. Just how, exactly, is it doing that? Magic. In reality, the speed limit feature relies on a roadway database in the vehicle’s navigation system. The limit is displayed in the instrument cluster and, for vehicles so equipped, in the Head-Up Display. The feature requires GM’s Next-Gen Infotainment (NGI) systems, which is typically assigned GM RPO code IO5 or IO6. We should also note that other automakers (including GM’s own Germany-based Opel), determine the speed limit by using a camera-based system that reads road signs. 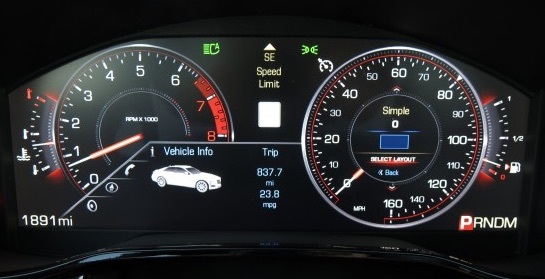 Pictured: 2014 Cadillac CTS digital gauge cluster; note the space for the speed limit at the top in the middle of the cluster. Well, that’s nice. Now only if the speedo wasn’t imprecise by law in Europe. > Just how, exactly, is it doing that? Magic. Oh, please, you’ve got to be kidding… Every navigation does it. >We should also note that other automakers (including GM’s own Germany-based Opel), determine the speed limit by using a camera-based system that reads road signs. Honda does this as well. It’s fun when it reads the top speed label on a lorry and thinks it’s a sign. Incorrect. In reality, most navigation systems do not do this. Some do, of course… but not “every” and not “all”. So you’re wrong right off the bat. And most auto manufacturers don’t have a technology similar to Opel Eye, which reads the signs to determine the speed limits. Perhaps Honda does in Europe… but not in its vehicles in the United States. Almost every 3rd party navigation. In your smartphone. Tomtom. Garmin. They all do this. Almost all. Probably almost, I’ve never seen one that doesn’t show speed and speed limits. We have a 2016 Silverado and cannot get the speed limits of the streets to show on the map. Can you give me the steps I need to go through to get the posted speed limits to be visible on the screen again? Thank you! Didn’t the second gen SRX already have this? Too bad GM’s OnStar doesn’t display the speed limit. Displaying speed limits is not new. Garmin model 2595LMT, which has been on the market for at least 5 years, has this feature. You’re correct. Alas, no one is saying that this feature is “new”… but rather pointing out its existence. The owners manual for my 2014 Buck LaCrosse says it will display the speed limit in the navigation screen, but it doesn’t. The owners manual has several inaccuracies. It also says there is a locking gas cap door, which it doesn’t have. When contacted, Buick just shrugged. My 2016 GMC Terrain Denali has this feature displayed on the Navigation screen . I think it is a nice feature and it is very accurate . I did wonder just how it knew what the speed limit was . My ’12 SRX also has it but is in the DIC screen . You have to toggle your way to display it and only works on the highway !? Back in 1976 my mom’s Olds 98 had a feature that worked with the speedometer . You set the gauge at a certain speed and if you exceeded it it buzzed at you . But thats not the same as the new Technology , just food for thought. It’s a helpful feature in my Lacrosse, though I have found it to be inaccurate on occasion where the speed limit has been changed (up or down). Oddly enough, some of them in areas that changed before my car was even built, so you can’t rely on it 100%. It’s a good starting point on roads where you can’t seem to find a speed limit sign. Also, there is no data for local streets, only (most) state roads and federal highways. All these systems have a small degree of error. There is no way to account for all changes. Just the small risk you take using it. Just read the signs for anything better. I have a 2015 Chevrolet Colorado.Why doesn’t my Colorado have heads up speedlimit display on the dash board I have all the options . Chrysler has the speed limit on their UConnect Nav’s, and you can set a verbal speed alert if you exceed that limit by a number you specify – very convenient way to avoid tickets in unfamiliar areas. MY old Garmin does this and I love it. I can’t figure out how to disable it on a 2014 XTS with the digital gauge cluster. The online owners manual states to hold the “SEL” button while the warning screen is displayed and then toggle up or down to set the desired speed. This did not work. I think I’ve gone through every menu in the car and can’t figure it out, and a call to the Caddy dealer was not helpful. Help! I need help! I have a 2017 Buick Lacrosse Premium and cannot locate how to display the Speed Limit sign. I know it was there when we bought the car, but !!!! someone; I don’t know who was pressing buttons and then the speed limit sign is gone!! I don’t know what I did, I cannot get it back again. Your help will be appreciated! A 76 year old should not be pressing too many buttons. I really think having the speed limit was really helpful when driving in strange areas where I don’t know the speed limit. Hopefully a few simple instructions on how to get it back. Question: My 2014 Buick Encore displays the speed limit accurately, but the background color of the little sign used to turn reddish when I went over the limit (even 51 in a 50 zone). Suddenly, it’s not doing that. Oddly, I kind of miss it. Is this an update I didn’t notice? A feature? Or did I somehow turn off this warning feature – if so, how do I switch that on and off? December 2017 I bought a 2017 Canyon with the feature side by side view of the speed limit icon next to the digital speedometer, 10 months later it is gone! I was told this was a mistake and shouldn’t have been on this year model pickup. “Bait and Switch” what other feature is going to “disappear” Unacceptable, but no one can help put it back. Very disappointed with GM. Anyone else have this issue? Our dealership is trying to “make a deal” which means more money out of our pocket for a newer model…….. just put it back!!!!!! We purchased a 2019 Impala & after first oil change either the dealer or I inadvertently set speed warning bell to 50mph. Why can’t we find information on how to disarm it? Nothing online or in manual that came with vehicle explains this??????? Now I have to go push buttons to set it at 90 mph so it won’t ring again unless I’m at Indianapolis speedway on race day!